Surly Karate Monkey, Single Speed, Mountain bike. You know the bike. The karate Money is a legendary cult classic known for being one of the first production 29er mountain bikes, with a fantastic reputation for being nimble and a lot of fun. This bike is in practically new condition as it was only ridden a handful of times. Comes 99% stock with a couple upgrades: -Lock on grips -Upgraded suspension seatpost Everything else is stock and fantastic quality: -Black 4130 chromoly frame/fork -Surly hubs -WTB crosscountry 29 Speed Disk rims -WTB ExiWolf 2.3 tires -Avid BB7 mechanical disk brakes/Avid levers -Salsa bars, 17 degree backsweep, 660mm wide -Sram truvativ firex crankset -Shimano Freewheel -Surly stem, seat post clamp, saddle -Generic pedals (not in picture) I’ll throw in some big fenders that fit large mountain bike tires as well. This bike is a lot of fun. 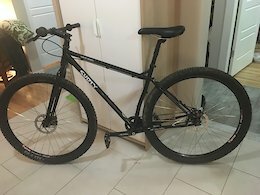 Super fast for racing around town, super fun on the trails, lots of standover height for technical mountain biking, steel frame/fork provides strength and vibration absorption. This bike is very versatile and can accommodate: -single-speed or geared drive trains -rigid or suspension fork -bike racks -fenders -front and rear derailleurs -two water bottles -mountain biking, touring, commuting, cross-country racing, whatever you can think of Size Medium It has a couple of very minor surface scratches on the paint, but no exposed raw steel. 99% perfect condition. As I said, Only ridden a couple times. Never in winter. I am reluctantly selling it, because I I need the money for a (ridiculously expensive) traffic infraction ticket. Very sad, but don’t have the money. Email me if interested. Deal of a lifetime. 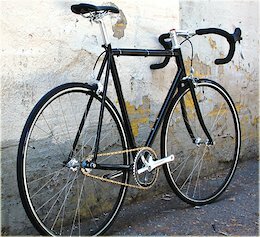 A bike like this needs a good home. Price is firm. Je parle Français.